It's always an absolute great time meeting up with the ladies of Bloggers Who Brunch On Fashion! 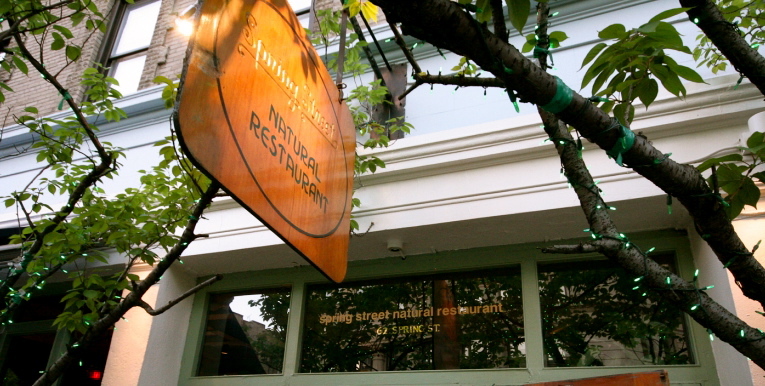 Last weekend the ladies and myself graciously gathered ourselves at Soho's Spring Street Natural Restaurant for a wonderful delectable brunch meal and talked about our passion of fashion blogging. Once situated we were all too well engulfed in the meals and greeting and catching up with one another. After our tummies were satisfied we took a quick stroll and stopped at C wonder and enjoyed the fashion and inspirational styles the store offered. After all isnt it a normal process of fashion bloggers to want to shop?? I carried my love of pins to the brunch! Kukua, Diana, and Catalina couldn't decide which was bracelet prettier! Kristen, Chantel, Ely, and Catalina stopped for a photo opp! Thank you ladies!! Kukua was shopping for a helmut and I told her it must definitely be in the photo! Lauren wore this amazing elephant necklace which I regret not snapping a picture of! It was a great meetup! We made our way to the local starbucks (first picture) to gather around again to really indulge in the essence of blogging from talking about social media, personal investments in blogging, etiquette in blogging, and media kits. Great Great Great information shared across the board! Looking forward to the next meetup! One thing I learned about meeting other bloggers is that all of us have our own individual voice and content. I love the individuality of it and that's what always stands out in the end. Be sure to check out the great blogs these ladies have! What a great afternoon! I really enjoyed everything about it, even standing out for an hour waiting and talking about hot men...LOL. I can't wait for the next one!